Papaya is a sweet, juicy tropical fruit with a soft consistency and exotic flavor.This fruit is appreciated for its attractive pulp color and immense health and beauty benefits.Find out how you can use this delicious, nutrient-bursting fruit to prettify your face, hair, body and for losing weight and belly fat. Papaya works as a natural hair conditioner.It moisturizes dry hair, smooth rough cuticles, repair split ends and maintains the natural softness and sheen of the hair. 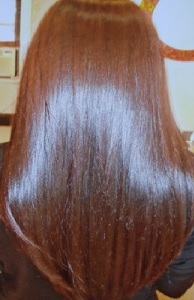 Combine all these ingredients together in a small bowl.Divide your hair into four equal sections and massage this paste into the hair and scalp.After 5 minutes, wash off with a mild shampoo. Loaded with vitamins A, C, and E papaya makes an excellent pack for brightening and whitening face.Pamper your skin with this two-step papaya facial and see your complexion bloom with a beautiful white glow. 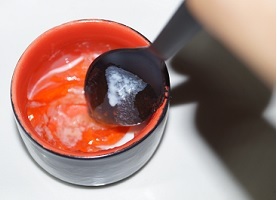 Combine a spoonful of ripe papaya paste with 2 tbsp of sugar and a tbsp of honey.Massage this paste for 2 minutes in a circular motion and wash off with lukewarm water. In a small bowl, combine few papaya and apple slices, chilled milk and sandalwood powder.Blend until smooth.Apply and leave on for 10 minutes.Wash off with cool water and rub an ice cube to boost your facial glow. Being relatively low in calories, rich in fiber and antioxidants, this fruit is the perfect, delicious and healthy choice for losing weight and stomach fat.It is also a rich source of enzyme papain, that improves digestion, boost metabolism and helps flatten your stomach. Want to lose 10 pounds and 2 inches off your waist in a healthy way? Then try our 10-days papaya diet plan to kick-start your metabolism, to lose weight and to cut down the stubborn belly fat.This diet plan works by replacing your two meals (breakfast and evening snack) with a bowl full of fresh papaya chunks for 10 days. For Breakfast – Mix a bowl of papaya chunks with 1/4th cup of skimmed yogurt, a tsp of honey and a pinch of cinnamon powder. 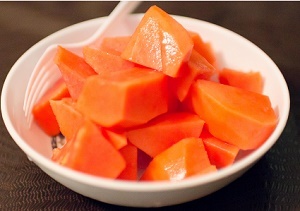 Evening Time – Sprinkle fresh lemon juice, black pepper and black salt over papaya chunks and enjoy. 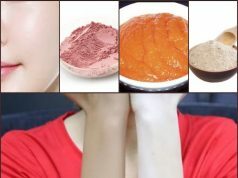 Mix equal amount of papaya paste and aloe vera gel with a few drops of milk to get a smooth paste.Keep this paste in the freezer for 5 to 10 minutes.Press the mixture over cotton pads and place these pads on the eyes for 10 minutes.Wash off with cool water.It instantly reduces puffiness and dark circles.The enzymatic action of papain help to smooth the appearance of fine lines around the eyes. A blend of fresh papaya paste with aloe vera gel and a bit of lemon juice serves as a great aid in the removal of dark spots on face and in enhancing the clarity and tone of the skin.If you have a dry or sensitive skin, then you can skip the lemon juice.Papaya has powerful enzymes that exfoliate your skin surface and helps in the removal of dark spots. Do you want to get rid of those stubborn stretch marks in a month? 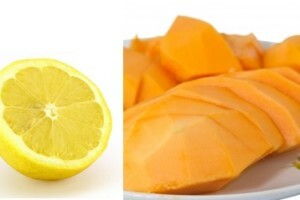 Then check out this all-natural homemade papaya stretch mark removal cream. 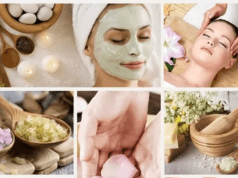 Papaya moisturizing and exfoliating properties make it an excellent remedy for dry, sore, cracked heels.Mix fresh papaya paste with a small amount of glycerin and massage your cracked feet with this mixture.Leave on for 10 minutes and then rinse off with warm water. Papaya is a very useful ingredient for removing unwanted facial hair.Grind 4 to 5 pieces of papaya into a fine paste and mix it with 1 tsp of turmeric powder.Evenly spread this mixture onto the affected facial areas.After 10 minutes, massage this mixture in a circular motion using a washcloth and then wash it off with cool water.Repeat this remedy at least twice a week to see the difference.This remedy is gentle on the skin and it is suitable for all skin types. Papaya is a good source of anti-aging antioxidants, vitamin C, and vitamin E that promotes cellular repair and healing.These antioxidants defense skin against many signs of aging, including wrinkles, fine lines, discoloration, dullness, etc..Grind 3 to 4 diced ripe papaya with 1 egg white, 1/2 carrot and 1 tbsp of honey until you get a fine consistency.Clean face with rose water and apply. Once the mask dries completely, wash off with cool water.This mask makes the face firm, smooth and delivers a youthful glow. 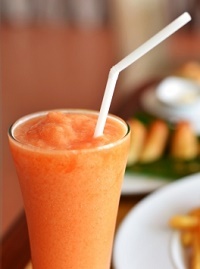 Papaya is one of the healthiest and nutrient-rich fruit in the world.It is packed with antioxidant nutrients such as carotenoids, flavonoids, vitamin A, vitamin C, and vitamin E that protects the skin against damage caused by the ultraviolet rays of the sun and also help reduce skin discoloration and pigmentation.Here is a delicious papaya smoothie recipe that you can add to your daily diet to prevent and reduce pigmentation. Blend all the ingredients well.Pour the juice into chilled glasses and serve immediately.This smoothie also helps in weight loss. Hello.! 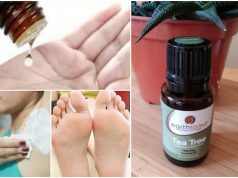 I really like your post and I have tried some of them and they have helped me a lot. Thanks for yr all hard work…..Keep sharing.